MORTON GROVE, Ill., Jan. 17, 2019 (GLOBE NEWSWIRE) -- Lifeway Foods, Inc. (Nasdaq: LWAY), the leading U.S. supplier of kefir fermented dairy and probiotic products to support the microbiome, today announced a new partnership with TruFusion Fitness Studios to launch a co-branded probiotic protein smoothie, TruEnergy fueled by Lifeway. TruEnergy is an eight ounce kefir drink that provides the benefits of 21 grams of protein and 12 live and active probiotic cultures to meet each member’s workout recovery needs. TruEnergy fueled by Lifeway was developed to address the need for a clean and convenient functional fitness grab and go offering for TruFusion members. Launching February 2019 in Las Vegas TruFusion studios and in Atlanta at the WheelsUp Super Saturday event, TruTribe members, celebrities and athletes alike will get a first taste of the vanilla-flavored offering. TruFusion, founded in Las Vegas, NV, is a premier boutique fitness studio in the United States offering over 65 modalities of fitness and more than 200 classes a week under one roof. Since launching in 2016, TruFusion has sold more than 96 franchises in cities across the United States including New York, Austin, Los Angeles, Philadelphia and many more. 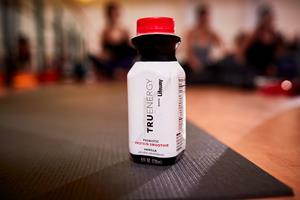 Launching in Las Vegas, TruFusion plans to expand TruEnergy fueled by Lifeway throughout its fitness studio footprint. The studio is a favorite of locals and celebrities alike. TruFusion is the latest fitness studio investment of the A-Rod Corp owned by Alex Rodriguez. Lifeway Foods, Inc., which has been recognized as one of Forbes' Best Small Companies, is America's leading supplier of the probiotic, fermented beverage known as kefir. In addition to its line of drinkable kefir, the company also produces cupped kefir and cheese, frozen kefir, specialty cheeses, probiotic supplements and a ProBugs line for kids. Lifeway's tart and tangy fermented dairy and non-dairy products are now sold across North America, Ireland and the United Kingdom. Learn how Lifeway is good for more than just you at www.lifewaykefir.com. Launched in Las Vegas in 2013, TruFusion was named “Best of Las Vegas” by the Las Vegas Review-Journal for its variety of classes, workshops and hot fusion workouts. With rapid U.S. and global expansion planned, TruFusion recently announced seven locations to open in the Philadelphia market, and others in San Francisco, Dallas, Austin, Birmingham, New York and Los Angeles (2019). The brand is also opening in-gym boutiques, called EDGE by TruFusion, inside 24 Hour Fitness-owned BFit Gyms. For more information, please visit www.trufusion.com.